Tara Reid, Frankie Muniz, Ryan Newman et al. When Fin (Ian Ziering) and April (Tara Reid) head to Florida, they are quickly warned of trouble ahead as the Sunshine State is overcome with strong winds and a dangerous tumult of rain. 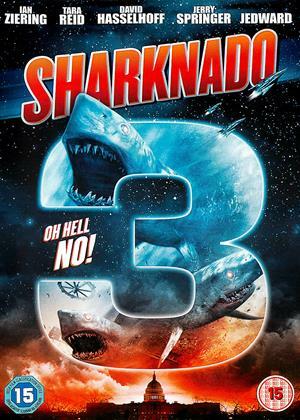 Suddenly, the pair find themselves in the midst of a terrifying and ruthless Sharknado, but it s just the beginning... As the sharks tear up the coast and head towards Washington D.C., Fin and April realise time is running out for them to warn the capital, stop the Sharknado for the third time and save the President of the United States from a brutal fate. Well if you watch this you know what to expect - loads of CGI sharks, comedy killings, spoof scenes, OTT hammy dialogue. Maybe a perfect movie to watch on a Friday night in a packed cinema where audience members usually cannot shut up talking - and it won't matter with dross like this, and maybe well enhance it! Not horror but attempted comedy, which is so OTT and predictable - the joke is wearing very thin now. Though Act 3 and the ending was shockingly awfully dreadful but a neat idea! One star is for that! But what is truly horrific is the fact 90% of large sharks have been killed in the last 20 years to provide shark fins for the Chinese and other Asians - THAT is the TRUE HORROR here. Look at the Shark Trust website to discover more - the shark fin trade is wiping out these beautiful animals who hardly ever attack people.